I wanted to see what would happen if I had a male sim I was playing get a female playable sim pregnant, so Pascal got busy with Fiona McIrish (of the Single Moms household.) He invited her over to his house, one thing led to another, and the condom broke he knocked her up. Way to go, Pas! Although it's sort of sad in a way. 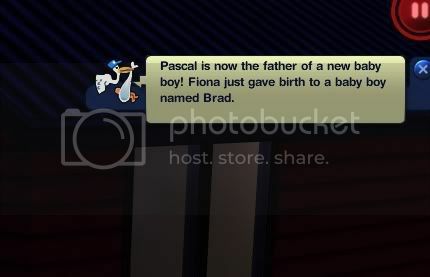 Now Pascal has rolled the wish to "Snuggle Brad" and they don't live in the same house. :( He rolled wishes to read pregnancy books and buy baby furniture during those three days Fiona was expecting, too. And he wanted a girl.